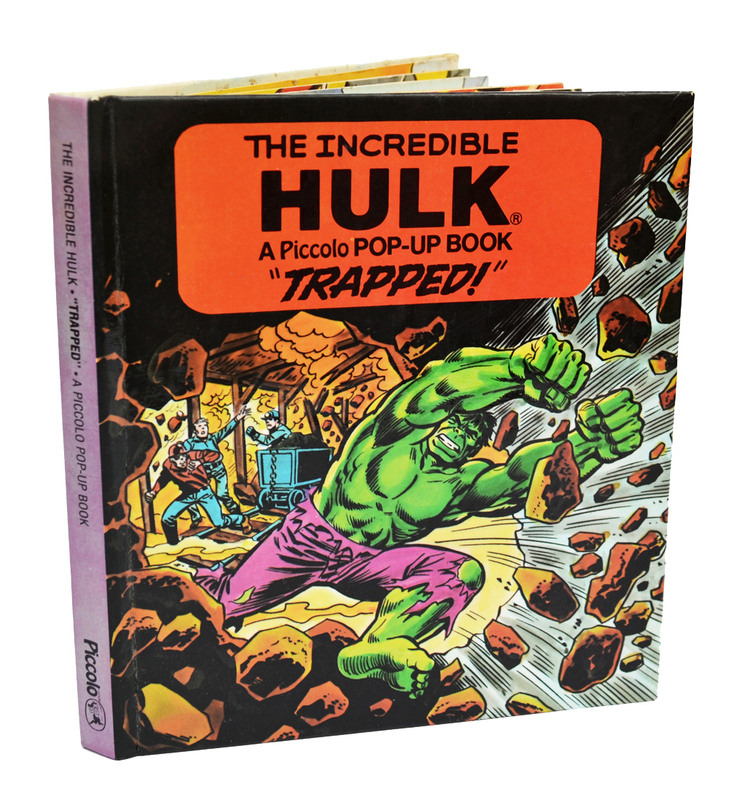 The Incredible Hulk: “Trapped!” pop-up book by Piccolo (1982) | 'TAIN'T THE MEAT… IT'S THE HUMANITY! 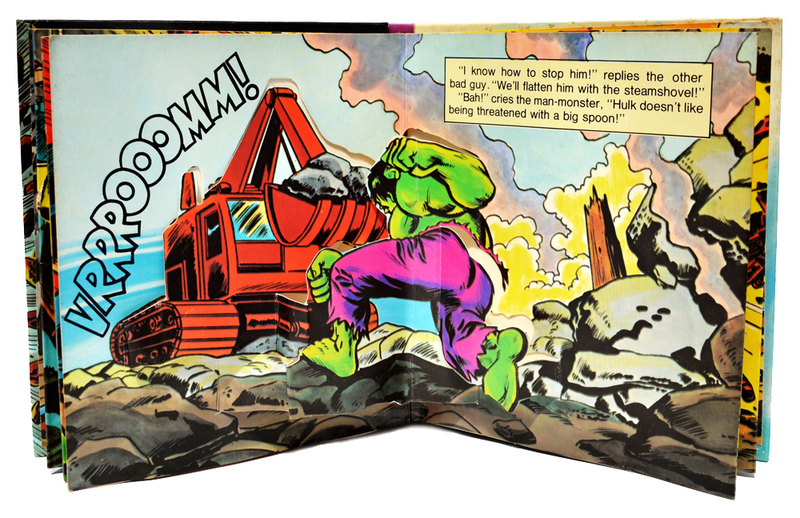 In the early 1980’s children’s book publisher Piccolo released three pop-up books featuring Marvel Comic’s popular superhero The Incredible Hulk. Trapped! was the second volume to feature the jolly green behemoth. 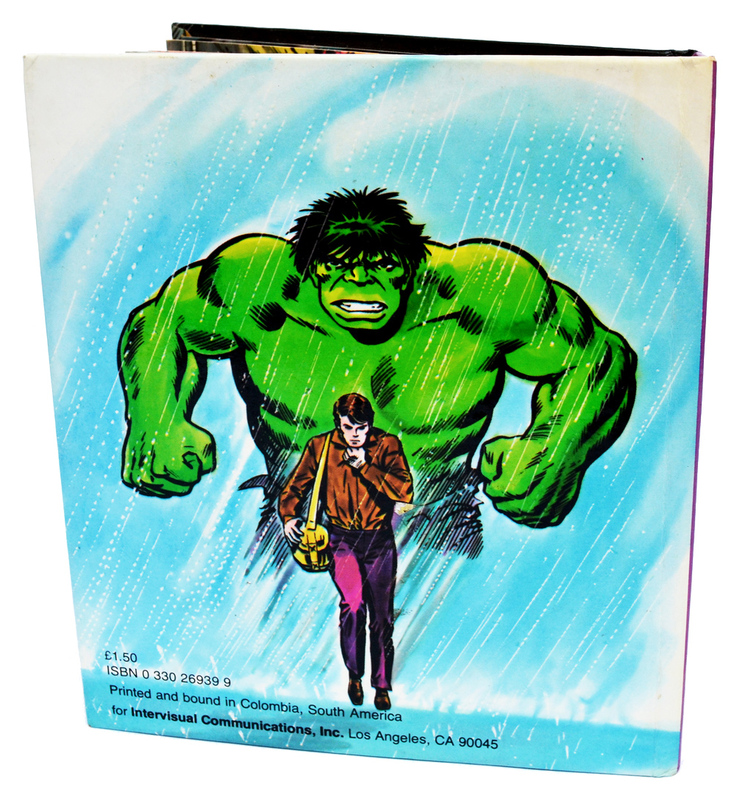 Running at 12 pages plus hardback covers this full-colour book measured a puny 5.5 x 6 inches, a great deal smaller than the first book in the collection (The Incredible Hulk from 1980), which came in at a far more generous 8 x 11 inches. The difference may not sound like much but at the smaller size the pop-ups in Trapped! don’t really ‘pop’ and there wasn’t any room for pull tabs, which helped make the first book so much fun. Marvel fans will recognise some of the names credited on the inside cover of the book: John Romita; Marie Severin and Frank Giacola, Marvel stalwarts all. 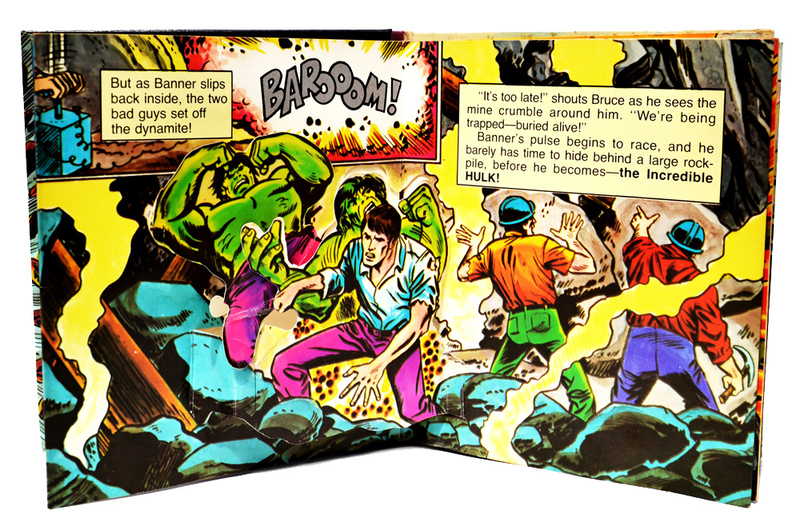 The paper engineer was Guillermo Roza, who also worked on the third pop-up book to feature the Hulk, Circus of Crime! from 1983. 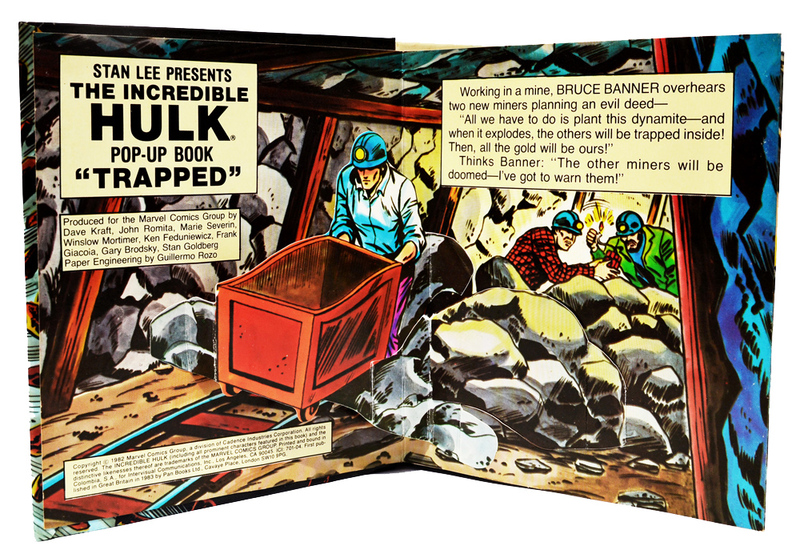 The story, such as it is, revolves around the Hulk foiling a plot by a pair of miners to steal gold from a mine. Bruce Banner, who just happens to be working in the mine at the time, overhears the plot, turns into the Hulk and quickly defeats the pair of criminals. The story wouldn’t win any prizes but it was a book aimed at kids and worked well in that regard. The pop-ups are fairly basic, although the one above where the Hulk swings across the page from left to right is quite impressive. One of the drawbacks of the book’s smaller size is the fragility of the pop-ups themselves – here for example, the Hulk has a habit of coming unstuck and I’ve had to repair this page several times. 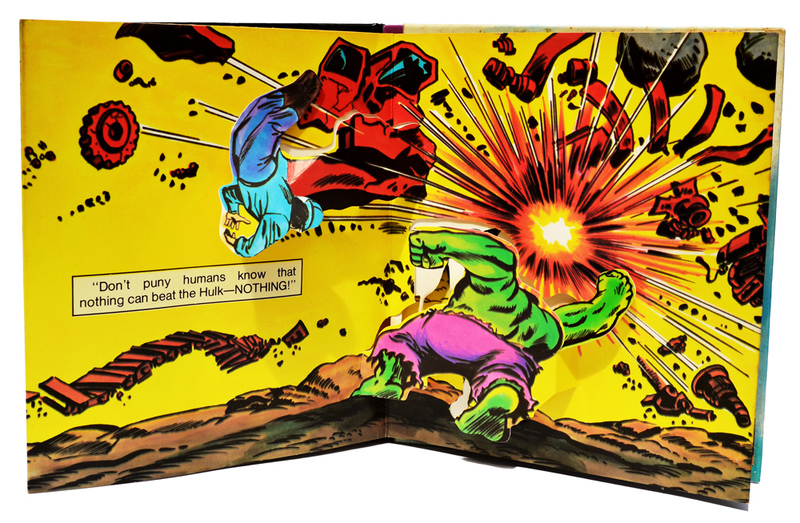 The pop-up above has the unfortunate effect of making the Hulk’s rear-end stand out further than the rest of his body. His bum does indeed look big in this pop-up. 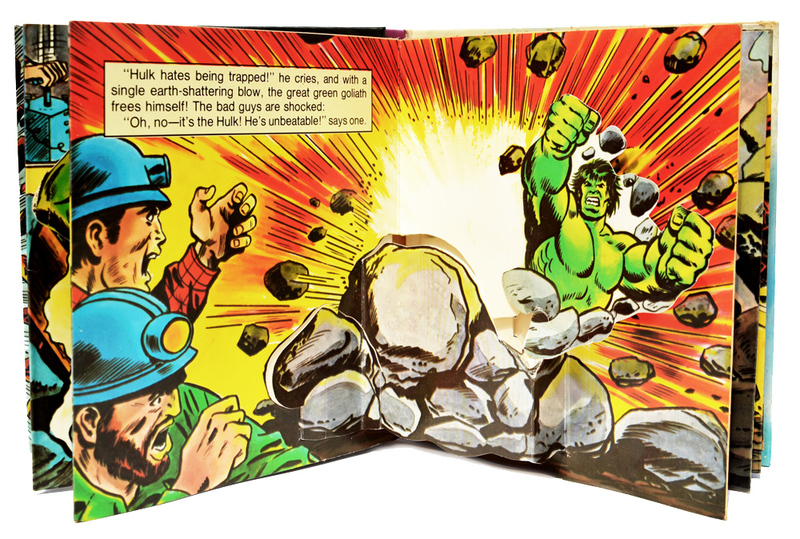 This pop-up features movement on the Hulks right hand, which swings to the right. The unfortunate crook at the top of the page also swings out to the left in a back-breaking backwards flip. And everything is neatly wrapped up at the end as the police arrest the crooks. Trapped! sold in the UK for £1.50 and second-hand copies can be found for only a little more than that. Although the book is fun, in a cheesy innocent kind of way, it will only really appeal to die-hard Marvel collectors and nostalgia fans. 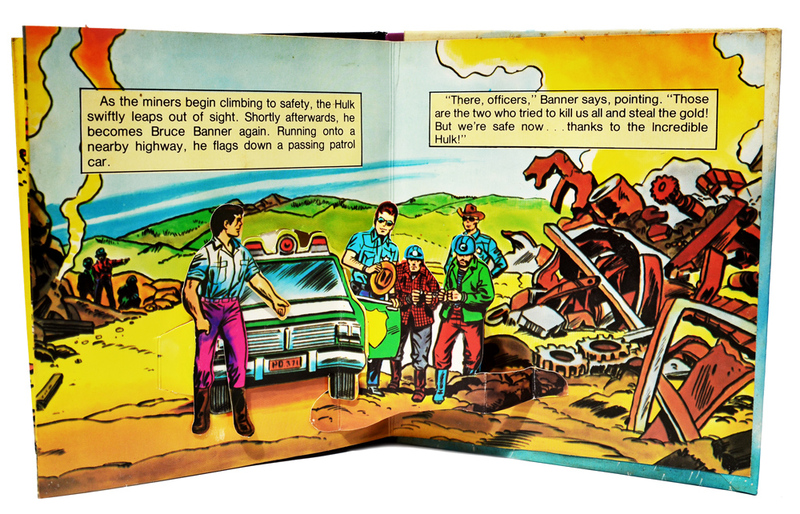 Between 1980 and 1983 Piccolo also released three pop-ups books featuring Spider-Man, the first two of which – Spider-Man and Attack of the Tarantula! – I’ve already looked at. Click on the links to see more.